Who doesn’t love decorating for the holidays when there are so many options to play with to make your home cozy and inviting! 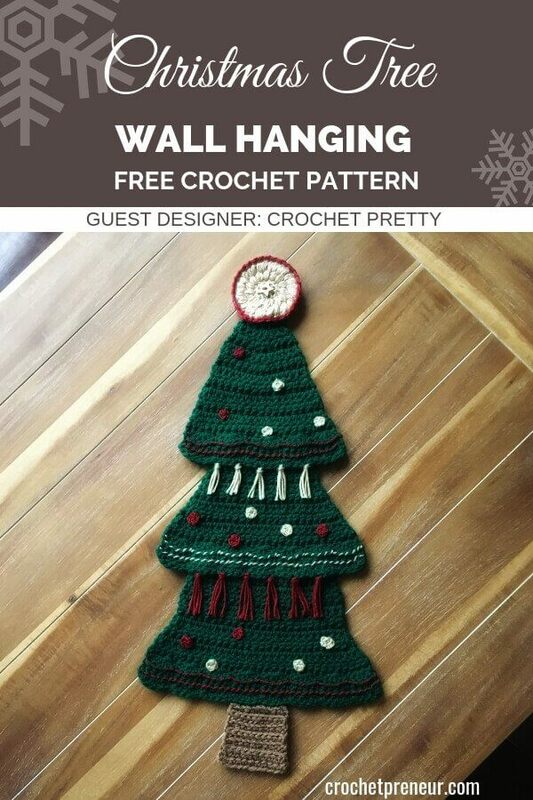 The Evergreen Christmas Tree Wall Hanging will add some color and some cozy to your home for you and your family to enjoy! This pattern works up quick, so put on your favorite Christmas movie and have some fun making something beautiful for your home! Yarn is always being help using 2 strands, except when making tree topper and ornaments. No matter your skill level, I always suggest that you read through the pattern from beginning to end before beginning your work just to be sure you don’t have any questions that might cause frustration during your project. This pattern is made in 3 sections for the tree (bottom, middle, top) which are then stitched together. The tree topper, tree trunk and ornaments are then sewn onto the tree. Chain(s) at beginning of rows DO NOT count as a stitch. Yarn over (5 loops on hook). Yarn over (7 loops on hook). Yarn over (9 loops on hook). Yarn over and pull through all 9 loops. Chain 1. Row 12 –ALL STITCHES IN THIS ROW WILL BE DONE IN THE FRONT LOOP ONLY Chain 2, turn. 1 SC in same stitch as chain 2. *1 DC into each of the next 4 stitches (which will be the 4 DC from the previous row). 1 SC in the next stitch* (which will be the SC from previous row). FASTEN OFF. Leave a long tail. Row 11 – Repeat row 7 until you have a total of 28 DC. Row 13 – ALL STITCHES DONE INTO THE FRONT LOOP ONLY Chain 2, turn. 1 SC in same stitch as chain 2. *1 DC into each of the next 4 stitches (which will be the 4 DC from the previous row). 1 SC in the next stitch* (which will be the SC from previous row). FASTEN OFF. Leave a long tail. Row 14 – ALL STITCHES DONE INTO THE BACK LOOP ONLY Chain 2, turn. 1 SC in first stitch. *Skip one stitch, 4 DC in next stitch, skip 1 stitch, 1 SC in next stitch* repeat from * until you reach the last 4 stitches. Skip 1 stitch, 4 DC in next, skip 1 stitch, 1 SC in last stitch. Row 15 – ALL STITCHES DONE INTO THE FRONT LOOP ONLY Chain 2, turn. 1 SC in same stitch as chain 2. *1 DC into each of the next 4 stitches (which will be the 4 DC from the previous row). 1 SC in the next stitch* (which will be the SC from previous row). FASTEN OFF. Leave a long tail. Alternate between hook sizes and number of SC to make different size ornaments. Make as many as you want to add to your tree. To add to tree, place ornaments where you would like them positioned and using a tapestry needle sew directly onto tree. Magic Ring. Chain 1. 7 HDC into the ring, slip stitch to first HDC. Row 3 – Chain 2. 2 Bobble stitches into each bobble stitch and chain 1 space from previous row. Before completing the slip stitch to first bobble, change color to red, then complete your slip stitch. Row 4 – Chain 1. 1 SC into each bobble stitch. Attach your button of choice to the middle of the tree topper with your tapestry needle. To attach the tree together you will: Lay out the 3 sections from the top piece to the bottom with wrong side facing you (picture below shows how it should look with wrong side facing). Lay the bottom section overlapping the middle section by an inch and a half. Take the long piece of yarn you left after you fastened off the middle section and sew together. Repeat the same with the top and middle section except overlap 2 inches. To attach tree trunk, you will use a tapestry needle. Position the trunk between the middle two shells (there should be a total of 8 shells at the bottom). Using the tapestry needle go through the bottom stitches of that last row (which will be row 12 of bottom section of tree) and then back through the tree trunk, continue doing this until the tree trunk is fully attached. To make tassels, cut yarn in 6” pieces. Taking two strands at a time attach to the last row of shells in the middle section and to the last row of shells of the top section as well. Garland, as I like to think of it, would be referring to the red and gold yarn that is woven into the loops of each of the bottom 2 rows of shells on each section of the tree. To do this cut a long piece of yarn and thread it through your tapestry needle. Take your needle and insert it into the outer loop of shell section, weaving around each loop (see picture below). To attach tree topper, take a piece of yarn in the gold color and thread through your tapestry needle. Then insert it through the middle section of the back of the tree topper. Place the tree topper on top of the top section of the tree, overlap as much or as little as you would like. Then just take your tapestry needle and sew directly onto the tree top section. Fasten off and weave in ends. To attach the branch to your wall hanging, thread yarn through your tapestry needle. Place branch right below the tree topper on your wall hanging, with your tapestry needle go in through the back side of one side then over the branch and then back through the same spot that you came in first. Repeat this until you get to the end of the tree top. Weave in ends. To hang I used 3 small pushpins and placed them at the top of the tree topper and on both sides of it. The pushpins I used were clear. And that my friends is how you make your very own Evergreen Christmas Tree Wall Hanging! Wishing you and yours a wonderful holiday season!!!! I know you’re going to love making the Christmas Tree Wall Hanging and I so look forward to seeing your finished product. Sarah Carver is the face behind the blog Crochet Pretty. She is a self-taught left-handed crochet designer and lover of anything handmade. A Kansas native with two boys ages 16 and 13, married to her high school sweetheart for 17 years. Drawing inspiration from anywhere she can her ultimate goal is to give fellow crochet artists quality patterns and to leave her blog with the desire to come back! As a maker she finds that crocheting allows self-expression through the pieces she designs.